Today on the blog we welcome author Cath Mayo, with her guest post ‘In Search of Ithaca‘, as part of the blog tour for her new book that she has written with author David Hair, ‘Athena’s Champion’ which was released on the 8th November 2018. Cath Mayo is a New Zealand YA, Children and Adult fiction author. Her two published YA historical novels are both set in Ancient Greece and her first novel received a Storylines Notable Book Award for Young Adult Fiction in 2014. She’s joined her considerable skill and expertise with David Hair to create the Olympus Series, an adult historical fantasy drawing on ancient Greek Mythology, following the adventures of Odysseus as he navigates the dangerous world of the Greek Gods. You can read Homer’s Iliad and Odyssey as stand-alone, fantasy-based tales. Or, like many others before you, you can ask whether these epic tales have some connection with reality. Are they written about real places, real events and real people? If you find yourself tempted into the latter camp, you can have a lot of fun but you may also find yourself in a spot or two of bother. The more ancient the historical period, the scarcer the facts – and extracting any certainty from the maze of Greek mythology is rather like a man taking a widdle outside on a gusty day. If he’s not careful, he can end up with a face full of his own piss and wind. Have you ever wanted to visit the Cave of the Nymphs? Stand before Odysseus’s palace, on the spot where the old dog Argos died? Before we go searching for landmarks on Odysseus’s Ithaca, we first have to decide where Ithaca is. At first glance, it looks easy – there’s modern Ithaki tucked up next to Cephalonia. Why question it? Especially when Odysseus himself gives a description of the place to his new friends the Phaeacians. That’s where the trouble starts. Some parts of this seem clear – Ithaca is indeed rugged; its highest mountain is called Neriton; Same is on Cephalonia, just across a narrow strait; and Zacynthos, also known as Zante, is a little way to the south. These are questions that have set scholars scratching their heads raw for the last 3000 years. So much so that the German archaeologist Wilhelm Dörpfeld went looking for Ithaca on Levkada, an extension of the mainland to the north of Ithaki, and recently Robert Bittlestone decided Ithaca had to be Paliki, on the western side of Cephalonia. Both “solutions”, vigorously argued, ran into trouble. Levkada and Paliki are, and have for a very long time, been peninsulas and neither are encircled by “many islands” (“amphi” always means “surrounded” in Homeric Greek, not “next to”, as Bittlestone argued). Bittlestone also worked himself into a corner by identified modern Ithaca – small, rugged and bony – as Dulichium, a place which would have had to have been rich, fertile, extensive and densely populated enough to have sent 40 ships to Troy and 58 suitors to contest for Penelope’s hand, far outnumbering the Ithaca/Same/Zacynthos contingents for both events. So, do we give up on finding Ithaca? Not if we put our maps aside – and our satellite images, our artificial, god-like view from on high – and approach Ithaca by sea, emerging from the Corinthian Gulf or sailing up the coast from the wealthy kingdom of Messenia, as the Ancient Greeks must have done. How might our approach to Ithaca unfold from a ship’s deck, heading out into the Ionian Sea? In August 2007, my husband Alan and I embarked on a ferry to Ithaki to find out. The initial part of the journey took on a measure of black farce – it was a stinking hot summer and large swathes of Greece were on fire. The smoke was so thick as we left Patras, at the mouth of the Corinthian Gulf, we could barely see the nearby shore, let alone catch a peep of far-away Mt Neriton over the Acarnanian marshes, as I had hoped. But slowly, the smoke thinned and the air cleared as we headed out into the Ionian. Gradually, landmarks appeared, filling out a picture remarkably like the one Odysseus painted to the Phaeacians. Zacynthos, over on our left, lay closest to the Peloponnesian mainland, its southern arms stretching east. Ahead of us loomed Cephalonia, perhaps two sub-kingdoms in one, with Same on the eastern side, and Dulichium commanding the fertile countryside round modern Argostoli, where so many Late Bronze Age tombs have been found. Its massive bulk – over 5000 feet high – dominated our view, while to our right spread a scatter of small islands, heralded by the knife-sharp cliffs of Ixia. And finally, furthest to the north, furthest from the sun’s path across the sky, the low-slung hills of southern Ithaki hunkered into sight, with Neriton peering over their shoulders. Now the islets and rocks of the southern Echinades gave way to larger islands on Ithaki’s eastern flank – Atokos, Kastos, Arkoudi, Kalamos, Meganissi – and Homer’s “many surrounding islands… lying towards the dawn” came to life in front of our eyes. 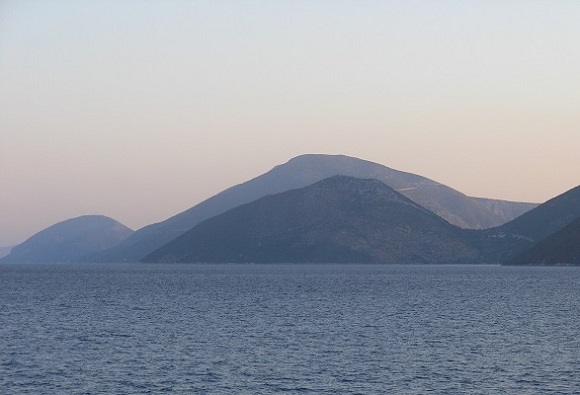 Some of the northern Echinades islands at dawn, from near Vathy, Ithaki. Mainland Greece is in the background. We had found Homer’s Ithaca. You can find out more about the authors by visiting the website/social media sites below.